The most prominent new-build part of the Delapre Abbey restoration – a conservatory – is going up fast and should be complete by summer. And when complete, the conservatory will be a key part of the abbey’s new life as a wedding and conference venue, as well as a tourist attraction. 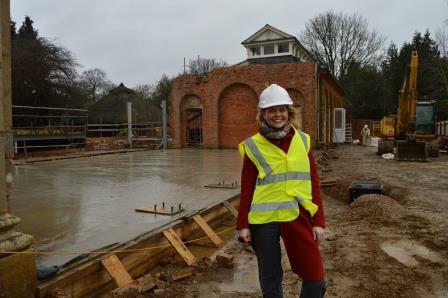 DAPT operations director, Rachael Boyd, said: “We had a sense of real excitement when we saw the slab poured as we’re seeing our plans for the new conservatory café becoming a reality. A large section of the extended abbey building is missing which, thanks to the discovery of a fountain in the footings, experts now believe was a winter garden. The fountain will be marked out in the flooring of the new conservatory, which will rejoin the dining room in the main building with the fully-restored billiard room – set to become a café and restaurant. Specialist conservation contractor, Woodhead Heritage, is carrying out the work on behalf of Northampton Borough Council. The £6.3 million project is transforming the Grade II* listed site from a derelict building into a nationally-significant tourist attraction. The Heritage Lottery Fund (HLF) has pledged £3.65 million for the project, which will be rounded up by Northampton Borough Council and other sources. Cllr Tim Hadland, the council’s cabinet member for regeneration, enterprise and planning, said: “This is a major milestone in one of Northampton’s most significant heritage project. “The conservatory will complete the south range of the abbey, filling a gap between the main building and billiard room. “It will form an exciting part of the new catering facility and will lead out into the abbey’s stunning grounds, an ideal setting for wedding photographs.